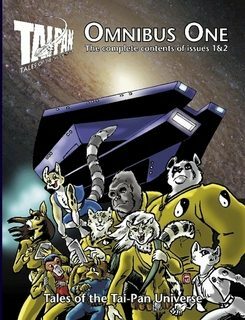 Tales of the Tai-Pan Universe #51, a furry science-fiction shared-universe fanzine that was announced in July 2015 as coming soon is finally here. It came out in July 2016, and is a double issue: #51 & #52. With a glossy cover and square binding, it feels more like a book than a fanzine. We're calling it a double issue, but at 162 pages and with 20 stories, issue 51-52 contains more than four ordinary issues' worth of tales! Fred Patten, the editor of Best in Show: Fifteen Years of Outstanding Furry Fiction (Sofawolf Press, July 2003; republished as Furry! 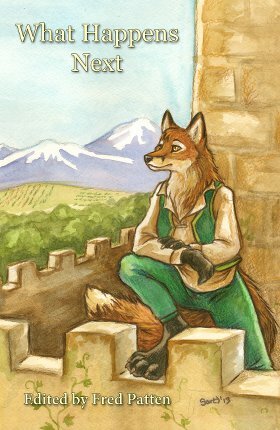 ); Already Among Us: An Anthropomorphic Anthology (Legion Printing, June 2012); and The Ursa Major Awards Anthology: A Tenth Anniversary Celebration (FurPlanet Productions, June 2012), will have a new anthology published by FurPlanet go on sale at Anthrocon 2013. Jenner and Dr. Benjamin Rat, M.B., B.S. D.R.A.N.Z.C.O.G. F.R.A.C.G.P. I was preparing this announcement, but GreenReaper has given away part of it on Newsbytes. 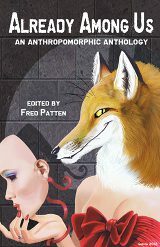 Fred Patten, who has been writing Furry book reviews since 1962, and who edited the first anthology of anthropomorphic short fiction, Best in Show, in 2003, has edited two new anthologies of anthropomorphic s-f & fantasy that will both premiere in June 2012. Already Among Us: An Anthropomorphic Anthology, will be published by Legion Publishing of Birmingham, AL on June 4. It will be available in a $18.95 hardcover and $9.99 trade paperback (x + 390 pages) [now $13.49], and $8.99 Kindle version, with a wraparound cover by Roz Gibson. 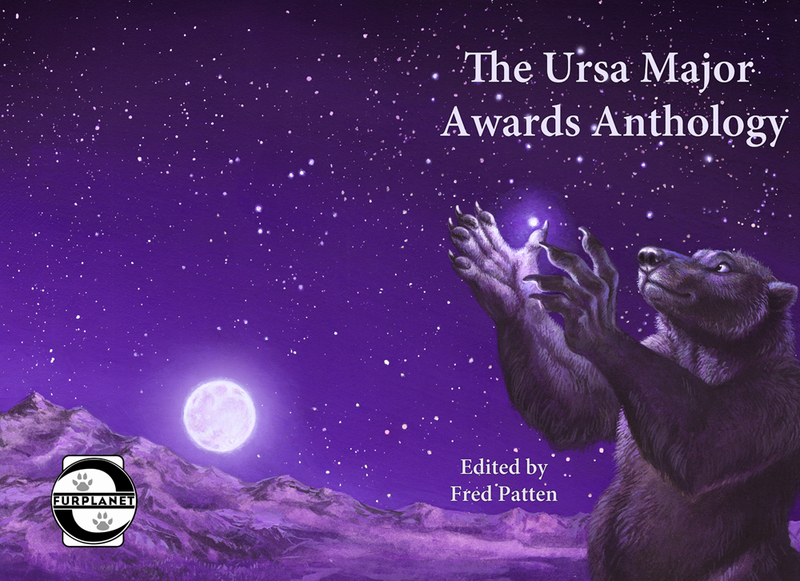 The Ursa Major Awards Anthology: A Tenth Anniversary Celebration, will be published by FurPlanet Productions of Dallas, TX. 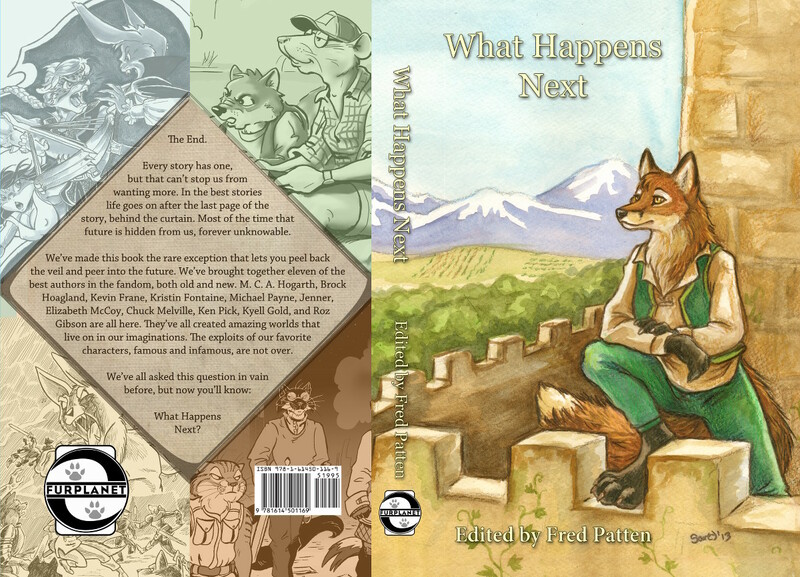 It will go on sale at Anthrocon 2012 on June 14, as a $19.95 trade paperback, x + 380 pages, with a wraparound cover by Blotch. Today, twenty-three years later, the Tai-Pan Project has included over fifty writers and artists. It incorporated as a not-for-profit organization in 2000. Its Editors-in-Chief have been Whitney Ware, 1988-1994, and Gene Breshears, 1994-present. It holds a social/editorial dinner Writer’s Night gathering in the Seattle area on the third Saturday of every month. Its publication, titled The Tai-Pan under Whitney Ware and Tales of the Tai-Pan Universe under Gene Breshears, is published approximately twice a year; issue #49 is scheduled for November 2011. 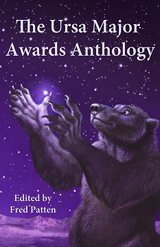 Tales of the Tai-Pan Universe won the Ursa Major Award for Best Anthropomorphic Magazine in 2003 and 2004, and the story “In His Own Country” by Kristin Fontaine in issue #39 won the award for Best Anthropomorphic Short Fiction in 2005. Tai-Pan Literary & Arts Project [Editor-in-Chief: Gene Breshears], September 2011. Trade paperback $15.00 (176 pages). Issue #43 of Tales of the Tai-Pan Universe is in the mail headed to all subscribers! Issue #43 should be available from Rabbit Valley and Second Ed soon. Tales of the Tai-Pan Universe #41 was is now available! Tales of the Tai-Pan Universe #40 is available now! The issue will be available soon from Rabbit Valley and Second Ed, or can be purchased at Midwest Furfest, or can be ordered directly from the publisher at the Tai-Pan website. Tales of the Tai-Pan Universe issue #39 is now available! Issue #39 features front cover by Sky Rigdon, back cover by Chuck Melville, stories by Kristin Fontaine and Mark Allen Davis with story illustrations by C.D. Woodbury and Chuck Melville. Plus additional artwork by Kathy R. Coleman, Gary Fletcher, and Sheryl Schopfer. You can get a peek at the cover at our web site, just go to www.taipanproject.org and click on "Available Issues." Tales of the Tai-Pan Universe #35 is available now! Issue #35 features a front cover by C.D. Woodbury, a back cover by Gary Fletcher, and stories by Chas P.A. Melville, Bill Koonts, and Gene Breshears, plus story illustrations by Kathy Coleman, Gary Fletcher, C.D. Woodbury, and Andrew Laverdiere. Tales of the Tai-Pan Universe #33 is available now! Tales… is the publication of the Tai-Pan Literary & Arts Project, a not-for-profit founded 15 years ago to produce the best anthropomorphic art and fiction in known space. There's a new issue of Tales of the Tai-Pan Universe available! Issue #32 features a front cover by Jennifer Anderson, and back cover by Sky Rigdon. The issue contains "Suffer the Children" written by Chuck Melville and illustrated by Bill Koonts, "Kiss and Tell" written by Gene Breshears and illustrated by Sheryl Schopfer, "Chop Job" a graphic story by Bill Koonts, and "Fifteen furs on a dead man's chest, yo ho ho! And a bottle of rum" a little commemoration of Tai-Pan's fifteenth anniversary. 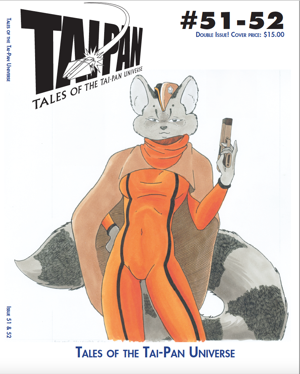 A new issue of Tales of the Tai-Pan Universe was mailed to all current subscribers earlier this week and will be available for purchase from Rabbit Valley soon! The issue may also be purchased directly from the editor at NorWesCon this weekend. The Tai-Pan Literary & Arts Project is pleased to announce the release of our fourth special edition, Tai-Pan: Bootleg. Bootleg is 50 pages long, contains two complete stories, over a dozen ringtail pin-ups, and artwork by ten different artists. For more details, plus information about our party and reading at ConiFur, click "Read more..."
#27 may be ordered directly from the publisher or from Mailbox Books. Tai-Pan Literary and Arts Project), check out this web site." The Northwest Science Fiction Convention (NorWesCon) is this weekend, April 12-15, and the Tai-Pan Literary & Arts Project is hosting their annual room party once again. This party will mark the thirteenth anniversary of the founding of the Tai-Pan Project, which produces a science fiction zine set in a shared anthropomorphic universe. In recent years the Tai-Pan party has been virtually the only furry event happening at this convention, but we're too stubborn to stop doing it. Look for posters at all the normal bulletin locations to find the room number. The party usually starts at about 3:00 on Saturday afternoon. There'll be food, sketch books, a lot of conversation, and probably some Cheapass games to join in. We'll have back issues available. So if you're in the Seattle area this weekend, drop in and say hello.